This is not a sponsored post and I have had no contact with either company. I bought each of these blenders with my own money and tested them as unbiasedly as possible. 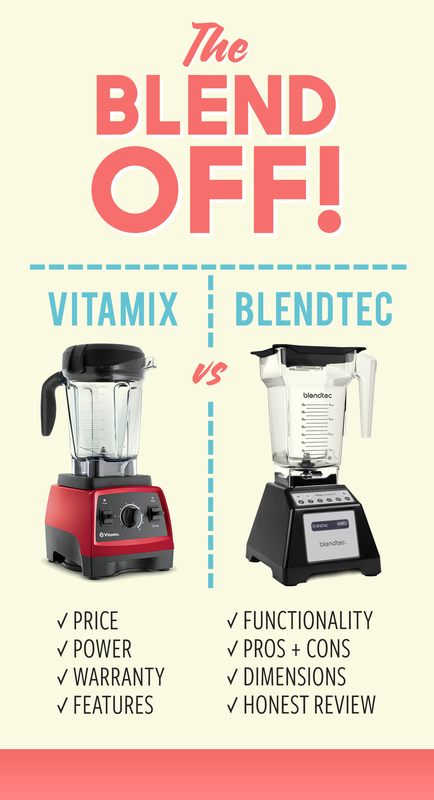 Many of you have inquired about my opinion on Vitamix vs Blendtec, so it was due time to share my formal review. Having now owned and extensively used both brands, I can confidently speak to each blender’s strengths and weaknesses, and which brand I would ultimately recommend purchasing. This particular model did not include a wand/tamper to push ingredients down while blending. This particular container tops out at about 4 ½ – 5 cups liquid for me, making large batches of soup or nut milks a bit of a challenge (have to divide into two batches). SPOUT – The spout is poorly designed and is not conducive to actually pouring ingredients out of the container. Nut meals and smoothies consistently spill over the small “spout” making it not ideal for pouring into small glasses and jars. MOTOR FAILS – It struggles to blend “difficult” ingredients like dates and frozen bananas. In fact, it consistently shuts off within the first few minutes of blending and starts smoking. Yes, SMOKING! Not to mention, it won’t even turn back on for another 5-10 minutes after shutting down. This is my #1 pet peeve about this blender. NO SETTINGS – I can’t walk away from the blender when it’s in use because there are no automatic settings (i.e. blender, soup), therefore it has to be constantly monitored (a huge downside convenience wise). PRICE – It’s crazy expensive and doesn’t live up to the hype in my opinion. Any blender I’m spending $400 on better not shut down and start smoking while trying to blend a handful of dates. Sheesh. SPOUT – The container is SO intelligently designed. It doesn’t have a formal “spout” because it doesn’t need one. Every type of ingredient pours out effortlessly from one of the four corners of the jar. CONVENIENT SETTINGS – I love that I can hit the “smoothie” button and walk away and it automatically turns off when the smoothie is done. It also offers manual speed options and a pulse. This is way more intuitive for the way I personally like to use my blender. MORE POWERFUL – I can blend dates, frozen fruits, and grains into flour no problem in my Blendtec! It has never once shut off or started smoking – an obvious plus. PRICE – I feel like I got what I paid for with the Blendtec. It just works better than the Vitamix in my experience. It blends, it doesn’t shut off, it’s reliable – end of story. If you’ve read this far, you probably know I highly highly recommend purchasing a Blendtec. In my experience it’s a much more reliable machine that simply works better than the Vitamix. I love that I can grind nuts and grains into flours, nut butters, nut milks, dates, frozen bananas, and sauces with ease. There hasn’t been anything this machine hasn’t stood up to! Of course, the Vitamix is still a decent blender from a reputable brand that will stand by its warranty. But if you ask me, it’s much better to own a blender that actually works and is reliable. Note: I purchased both of these blenders with my own money and have had no contact with either company (especially not for this review). The links to purchase the blenders are affiliate links, so we will receive a small portion of your purchase if you should choose to shop using our link. Great review – especially as I’m looking for something that can blend dates and currently my nutribullet just dies when I try. Would you be able to use the Blendtec blender for making things like thai curry paste and pesto, or is it just too large? I’d love your input, please! I have a new Blendtec (the same one you reviewed here), and it doesn’t get cashew-based sauces creamy (or sauces with raw garlic or ginger). They have chunks of cashew/garlic/ginger, even after 2-3 min blending. They are raw cashews soaked for 1 hour or more. Can you please advise how you get yours smooth? Do you need to stop and break the air pocket lots? Which setting do you use? Do you need to measure a double batch? This is the main reason I bought such an expensive blender and I’m really surprised it’s not working. I love my Blendtec! My mom and I own one, but my sister-in-law sprung for the Vitamix. I love how it is more compact and will fit under the kitchen cabinet. The Vitamix will definitely not do that. However, I do think the Blendtec is a little louder. Shoutout to Blendtec’s customer service though – two years ago I was using the Blendtec for a thick dough, and it started smoking. When I opened up the jar, there were bits of the rubber gasket that had shredded into what I was making! I called their customer service and they offered to 1) send back my base so it could get repaired (1-2 months) or 2) return my base and they’d send me a refurbished newer model. I ended up with the new (refurbished) one and it has been going strong. Sorry, I totally disagree. Vitamix is the superior product. I have owned several models of each Blendtec and Vitamix machines. The integrity of the Vitamix machines are far superior to those of Blendtec machines. Blendtec jars/container are also inferior as compared to Vitamix containers. I encourge anyone considering buying a Blendtec or Vitamix blender to actually do a physical comparison of each before purchasing. Those of you who have access to the Consumer Reports website should check out their unbiased blender ratings. Make a note of what machines they recommend before making a decision. I’m thinking the reason her VM smoked and quit was because she was running it on variable speed. Run at high setting, that doesn’t happen. Talk to the factory people and they have been super in helping e with and question/challenge. Bought a Vitamix a few years ago. In doing an initial clean, I blended soapy water. To my surprise, the black bits of plastic teflon peppered the suds. Again and again I ran soapy water through the unit only to find that a tremendous amount of plastic was sheering off into the container. Come to find out, this was a well known Vitamix issue that the company allowed to go on for years without fixing. It’s apparently resolved now but I will never trust Vitamix. Thanks for sharing information. I want to buy the Blendtec blender. I want to know its price. Hi! It’s anywhere from $399.99 – $415.00 new / $199.99 – $279.95 refurbished! Does the blendtec get things as smooth as the vitamix? I’ve used my friends vitamix on multiple occasions to make cashew sauces and it gets it so smooth and creamy. No grittiness at all. However dropping that much $ on a blender is painful lol. Thanks for the comparison. I think both blenders are excellent machines and I love that both are made in the USA. However, I agree with others who have pointed out that comparing a used machine with a new one is not a fair comparison. I have the 7500 machine, which I bought new. I’ve had it for over 4 years and I’ve NEVER had the problems you speak of. I blend ice, dates, frozen fruit and frozen veggies constantly. My Vitamix has never smoked, let alone shut down. It just works! I swear by it. I also find that the blades are not very sharp. Anyway, I just clean it as directed, by blending with a couple of drops of dishwashing liquid in half a container of water. Having a tamper is the reason I chose the Vitamix over the Blendtec. I do agree that without presets, I can’t walk away, but I can watch for the 30-45 seconds it takes to make sure I have my perfect smoothie! I’m thinking about buying the blend blendtec but I’m wondering if it comes with a glass pitcher? Do you know? I have owned a vitamix since 2005, replaced it with a Blendtech 2 years ago, it’s a good blender but I prefer the speed control and capacity that the Vitamix offers. The review was spot on, Blendtec is a superior product when compared to the vitamix and its sharp dangerous blades. Something else that was not mentioned is how much easier/safer the blendtec is to clean. Will it blend? That is the question. Quite frankly it sure will when you are using three horsepower and the blade designed by Tom Dickson which is amazing. That’s another reason Blendtec does not provide a push rod. Because it is not necessary due to the engineering of the square jar and wing tip blades. I have been using my Blendtec nearly everyday since 2012 and am still overjoyed every time I press the smoothie button! I bought a brand new Vitamix -not refurbished- and have had lots of issues with it getting stuck and the motor shutting off over the years. No smoke thankfully, but it definitely doesn’t give off a good smell. So, I appreciated hearing that I am not alone in this experience! Also, I was just about to buy a replacement pitcher for my Vitamix but it is very expensive so I’m considering skipping the new container and putting the money toward a Blendtec instead. Your review was very helpful, thank you! You failed to mention vitamix has a 7 year warranty and the best customer service. Usually they will replace the container and tamper when accidentally broken once for free. Also if you use the tamper, your vitamix will not smoke or shut off. As with any electronic product it comes with instructions, a DVD, and great online resources to those you how to use it. If you read the manual or wondered what the tamper was for, you would know the need to use it for nut butters, frozen fruit, etc. Also, you weren’t comparing apples to apples refurbished or not. There are quite a few models offering variable speeds and presents. There are also a variety of containers. No I don’t work for vitamix, but I wouldn’t trade mine for anything! I raw feed my dogs and essentially raw feed myself. My Vita Mixer is used daily. Love, love, love it. Have only bought new ones for whatever upgrade and passed the old ones on to friends and they (the VMs) are still working just fine. I did a lot of research before making my decision. I attended the demos at the warehouse clubs, asked friends who had each and scoured the Internet for reviews. The warranties on each were the same (maybe that changed since you bought yours). I found favorable reviews for both but the most important advice I found time and again was that either choice was a good choice. You couldn’t make a mistake if you chose one or the other. Their specs, performance, cost, reputation, customer service and customer satisfaction are comparable. If you’re going to purchase look at them both and select the one that best meets your expectations. I have had a vitamix for over 30 years! I have some trouble occasionally with the motor struggling to get the frozen stuff ground but have found if I put in a little at a time instead of dumping all, it handles it much better. Also the store, Sur La Table, has a fabulous silicone spatula just for blenders like the Vitamix. The very end of it is slightly curved so it can scoop anything out from under and around the blades and it is longer than the Vitamix container. And yes, I do not know what I would do without the tamper! I love my Vitamix but was happy you reviewed both as I have heard much about the BlendTec and have been wondering about it. I love my Blendtec! I’be had it for ten years and works just like the first day I got it. It was a huge decision for me to get a blendtec or vitamix. Finally a pastry chef friend told me that for my usage either would work well for me. Based on my experience, If I needed a new blender, I would definitely stick with the Blendtec! I agree with others that it is not a fair comparison since you used a refurbished vitamix with incomparable settings. My experience has been the exact opposite. I went through TWO blendtec’s before finally buying a vitamix. The blendtec’s each started smoking within 3 months- 8 months of use and made all of the food taste like burned metal, and couldn’t chopped up anything harder than soft fruit. So far the vita mix has blown the blendtec out of the water. I can only agree with you on the fact that the vitamix doesn’t fit under my cabinets like the blendtec could, and it’s heavier than the blendtec– but neither of those are huge concerns for me. I’d rather have a machine that can actually blend frozen fruit and not make my food taste disgusting and smoke up my kitchen than be able to fit under my cabinets! Thank you so much for doing this post. I saw you used the blendtec and almost every other person I see uses a vitamix and I always wondered if it was better. I am looking into purchasing one but don’t want to spend a ton of money on something that isn’t going to last a long time and be worth the money! It was a little concerning to read this review of the vitamin. If you read the instructions about how to use the vitamin properly, the shut down feature is a safety feature that happens when it’s not used correctly. Basically your review of the vitamix told me you didn’t read the manual and were using it wrong. It is not supposed to shut off, smoke, etc. However, I think this probably brings up a fairer point against the vitamix – it’s not a set and walk away type of machine (the manual one). Blendtec sounds like you can throw whatever you want in it and it will blend. Vitamix requires more understanding of what you’re blending and how to blend it. Wow this review could not have come at a better time! I was just talking to my boyfriend about whether or not we made the right decision in purchasing the Blendtec. I have absolutely loved the blendtec since we got it 6 months ago, but recently I have been wanting to make thick and creamy fruit based ice creams and I feel like I can’t do that without a tamper. I have to keep adding water and then by the time it blends it is way too thin. I have never used a Vitamix but I just assume the tamper would solve this issue. So I’m curious, how do you blend frozen fruits with the Blendtec? How can I get a thick and creamy result without overheating the blendtec or having to add too much liquid? I LOVE my Blendtec. I use it daily and have never come across anything it couldn’t pulverise! Team Blendtec! I intitally purchased because I couldn’t afford a Vitamix but I absolutely love it! So easy to clean and like others said the blade not being sharp is super nice. I love the wide top and I especially love the smoothie setting. I’m happy to see a food blogger preferring Blendtec because it seems like EVERYONE else has a Vitamix and I was feeling left out but just couldn’t justify tgit price! I have a VitaMix and have no experience with the Blendtec so I can’t compare. But from the specs given in the review, I would say that higher horse at lower weight isn’t safe (Blendtec). I’ve always considered the weight of the Vitamix, and the fan it has, to be necessary to control something that could easily spin right off the counter at high horse. So to me, weight is not a “con” at all. I’ve also never had an issue cleaning my Vitamix, or blending any consistency of anything. Certainly have never had it overheat or smoke. But this is simply my anecdotal experience, and not a fair review. This is a bit of a tangent–have you seen the Blendtec ad campaign “Will it blend?” The company decided years ago to try to liven up their blender’s rep with a kooky ad campaign and their videos are great. My favourite is the one where they put a bunch of action figures, including one of Chuck Norris, into the blender. Of course, Chuck is the only one that emerges unscathed. I love my refurbished Blendtec! One thing you didn’t mention was ease of cleaning, which is what sold me on the Blendtec. Not only is it one piece (plus the two-piece lid), but the blade is not sharp, so no chance of injury when cleaning. Never turning back. No regrets! I did a lot of research before I ended up with a vitamix. Mine has pre programmed settings that I can walk away from while doing other things. Have had no issue so far with any job. I can even make soup in it and it heats it up piping hot. Also has a self-clean setting. Mine is tucked away under the counter for ease. I use it daily. It would be a bit heavy if I had to constantly get it out from a cupboard. Oh, I forgot to say that our big jar fell on the floor and broke. I phoned Vitamix and they were really good about it and sent me a brand new one which is worth $100 Canadian. This was great because we already owned the machine for 3 years. Customer service is wonderful. I have the Vitamix Total Nutrition Centre 3. It has three settings that can be turned on and you can walk away and it will stop when done. They are for: smoothies, ice cream type to mix, and soups. Plus it has a pulse feature and has a switch that goes from 1 – 6. We love our machine and the one time it was working too hard and my daughter didn’t use the tamper to help it along when needed. It shut off and we thought it was broken because it didn’t work right away. However, this is it’s safety feature to let the motor cool before it will work again. My one complaint is that it can be a little tricky to get out things like nut butters because the jar is so long and narrow and thus tricky too clean with something like this. Otherwise, super machine that is used 2 – 3 times per day in our home. Such a helpful review! Have you found that the wand/tamper is a useful feature? Has there been any instance in which not having the wand on the Blendtec was an issue? I would love a tamper for my Blendtec. The tamper would come in handy when I am blending up a bunch of frozen fruit. Mine seems to create an air pocket and a tamper would be good for that. I still love my Blendtec and would not hesitate to get another one. Mine is a refurbished unit and with Blentec service department and there willingness to keep you happy it was a great purchase for me. I agree with others that a refurbished Vitamix vs new blender may not be the most fair comparison. HOWEVER, I will day I agree with your conclusion in the end. I love my Blendtec. I just do the self-cleaning Blemdtec recommends–some water, a little soap, pulse for a few seconds, dump, wipe off any little bits that didn’t come off, and rinse. Takes just a few seconds. Same process for cleaning the vitamix! Sorry but this isn’t really a fair review since you bought a refurbished Vitamix! Do you think maybe the shutting off and smoking could be because it was probably once broken (hence the reason for refurbishing)? And there are Vitamix blenders that have pre-programmed settings like your blendtec, but you bought a one that didn’t have that feature… I don’t really understand the point of this comparison since you are talking about two different types of blenders and one was refurbished and one was new. I completely agree. My vitamix has never struggled, let alone smoked, and there are multiple versions that have preprogrammed settings. I agree with the reviewer. My non refurbished vitamix shuts down and smokes for dates and nut butters. No matter how much coconut oil I put in. Mine does too, in fact had to send it in to be rebuilt within 3 years of purchase. Mine also moves all over the counter on high speed. I am thinking my next purchase will be a Blendtec.